Anyone who knows me understands my deep obsession with everything French! 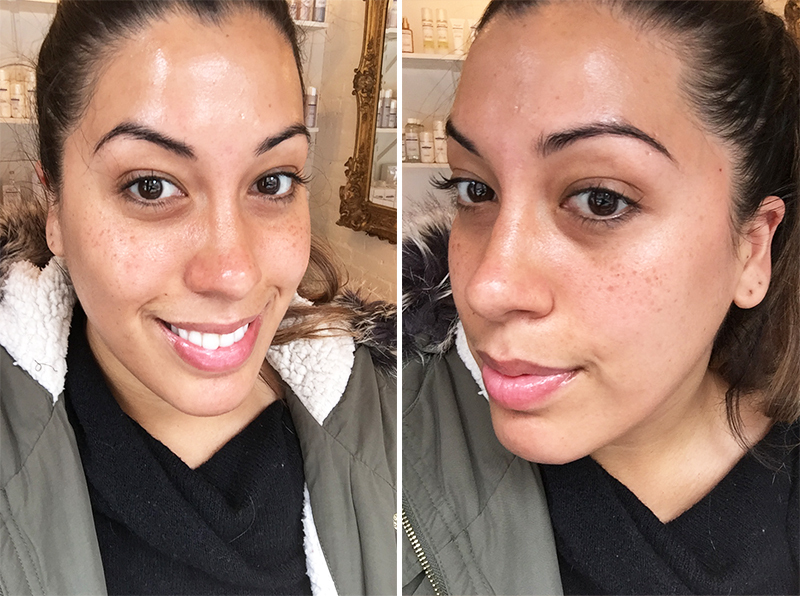 So, when I found out that DAPHNE European Skincare & Sugaring Studio was offering unique French-inspired facials, I knew I needed to hop on the next A-train downtown and experience these luxurious treatments for myself. Inspired by time-honored French beauty secrets, I was ready to enter skincare heaven. Ooh la la! 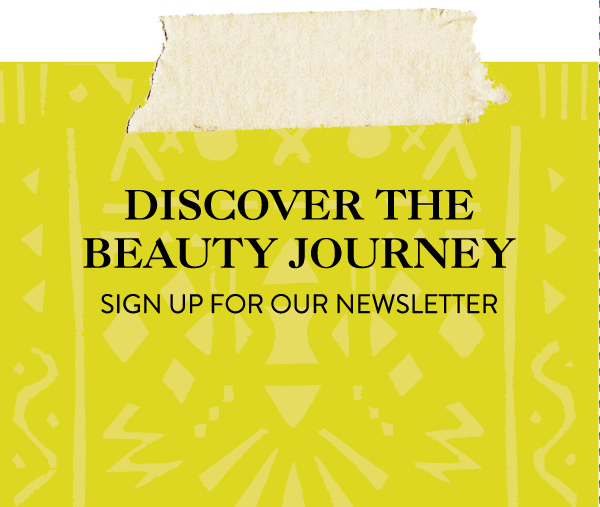 Rooted deeply in the traditions of French beauty, luxury skincare brand Biologique Recherche has become de rigeur for the jet-set wanting exclusive and effective skin care. Since these products are only available in a handful of top locations throughout the US, the select spas that offer them can provide face and body treatments you won’t find anywhere else. DAPHNE is one of these elite spas, and to fully immerse myself in the Biologique experience, I booked the “Ultimate Facial.” I was definitely ready for some pampering, and the intensive and results-oriented facial promised to dramatically improve and restore my skin in one 120-minute session. Formidable! The morning of my facial, I hit a snag in the form of a snowstorm blanketing all of NYC, but I wasn’t deterred. 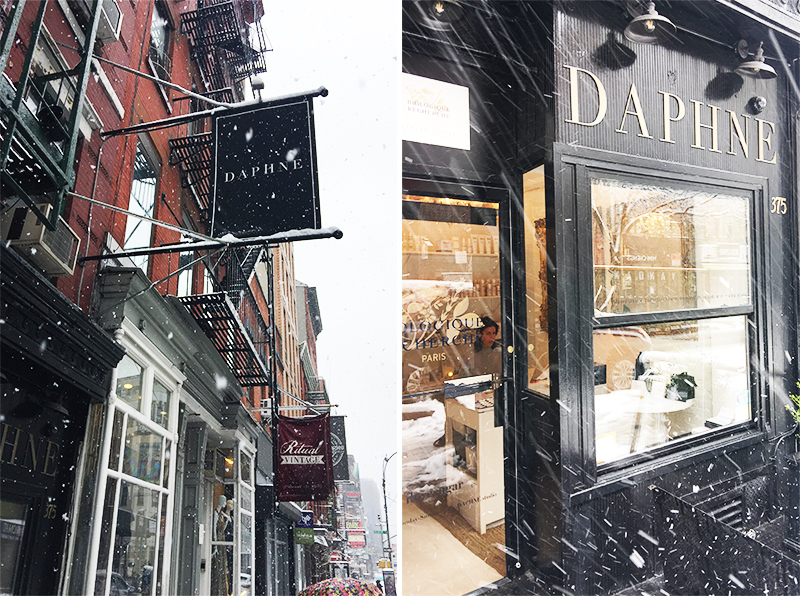 The beautiful white flakes swirling through the air made my journey feel like an adventure that would lead to the discovery of a beautiful hidden treasure (and a treasure, indeed: at $495, it’s one of the most expensive facials in NYC). Located in the stylish and charming Nolita neighborhood, DAPHNE feels like a destination spa — it exudes French chic in all its details, from the wood trimming to the plush white rugs. After checking in, I was led to a peaceful room to drink tea, smell the beautiful French Lavender in the air, and get a little style inspiration from the gorgeous fashion books. My session would include a combination of a customized peel along with a non-surgical facelift. In addition to those more intensive treatments, I was also treated to a personalized mask, an eye treatment, and an oxygen infusion. My facialist was the amazing Jade, and I’m pretty sure at some point I fell asleep from sheer relaxation and skincare bliss. 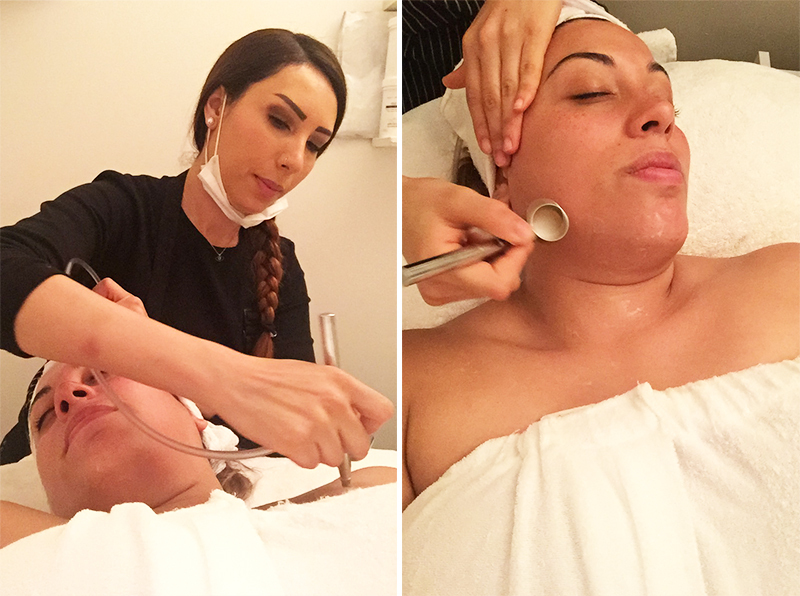 With any facial, the extraction portion is usually painful, but the extraction Jade did felt like nothing at all. My favorite part of the facial was when she used an oxygen gun directly on my skin, and I could feel my pores being cleaned out one by one. When I emerged on the other side of my French beauty journey, my skin that was hydrated, plump, and baby-soft to the touch. 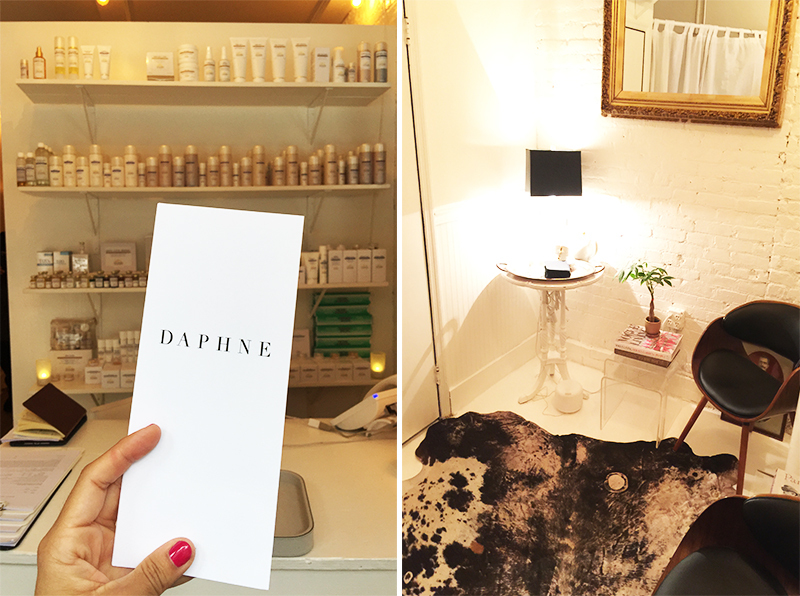 Along with facials, DAPHNE offers another beauty ritual experience, albeit a much more ancient one. The “I Love Sugar” experience is modeled after traditional Egyptian Sugaring techniques, which uses a paste made from lemon, sugar and water to remove excess hair in the direction of the hair growth. The natural ingredients and absence of conventional waxing strips mean less pain, less ingrowns, and longer, smoothless results. While many sugaring studios exist in NYC, DAPHNE offers the most authentic and effective experiences possible. I left DAPHNE feeling indulged, relaxed, and with that definite French je ne sais quoi glow. I can’t wait to return to my own slice of Paris right here in NYC! Interested in learning more ? Visit http://www.daphne.studio/ and book your next appointment. Great for pre-wedding rituals, and give the skin a deep cleansing and natural lift. Personalized mask, an eye treatment, and an oxygen infusion by Jade. 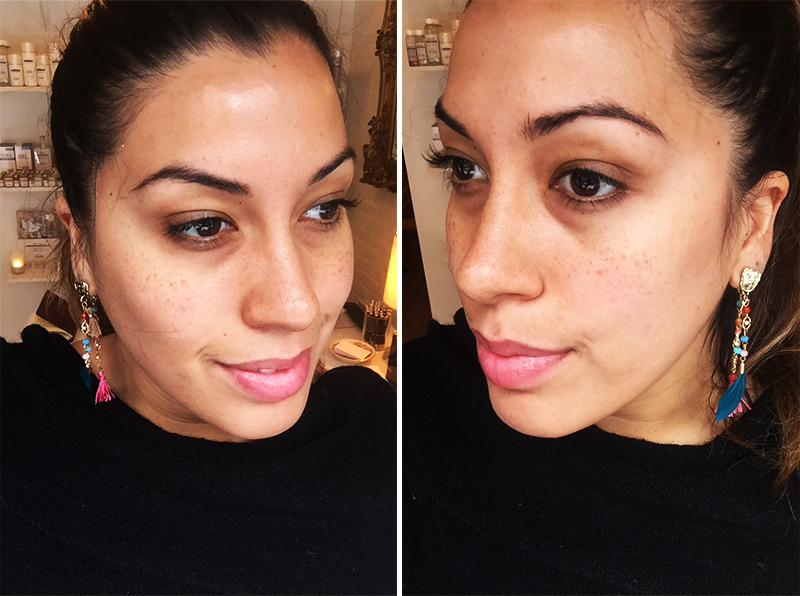 Skin after my incredible facial: glowing, and brighter. Skin before my facial: Dry and hyperpigmented.